I came across this amazingly good article by Cecilia D'Anastasio on Kotaku titled Dungeons & Dragons Wouldn't Be What It Is Today Without These Women. It's well researched and tells about the contributions of women like Jean Wells, Penny Williams, Rose Estes and our favorite map-maker Darlene, as they worked among an industry that was very male dominated. 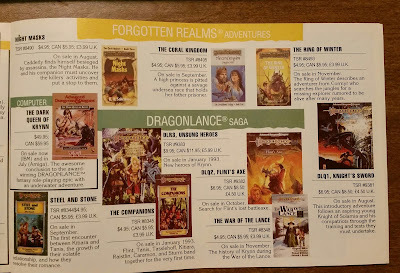 I was lucky to hear Darlene touch on this subject at GaryCon this year, now read about it here. Enjoy. Quiet week at Greyhawkery. Hey it looks like I won't be going to GenCon this year. If I do it'll be for one night and very last minute planned. I'm not entirely sure I'll miss much as most of the big games I'm interested in have already announced plans or released their stuff at other dates. GenCon for the average D&D enthusiast is really lacking for me nowadays. I love the social aspect, I love Indianapolis and I love the crowds, but I don't miss the hotel scramble and the sameness of everything. I've been to too many of these I guess, which is why GaryCon was a nice diversion this year. At any rate, is anyone going this year? Is there something I'm missing out on? Well met, Greyhawkers! Today I'm sharing a map I did a month ago featuring Ulakand, the capital of Ull in the Baklunish West. Anyone who knows me, knows I am the #1 source of fan-made Ull material. I adopted little undeveloped, unwanted Ull back in 2004 by doing several articles for Canonfire. Since then no one, not even Living Greyhawk, Wizards or anyone has touched Ull, but me. Yes, I'm bragging, cause I've put a lot of work into this realm. And this map of the Ulakand Mesa is my latest addition. The map is hand-drawn in ink on hex with hex with hex paper I acquired from Black Blade Publishing at Garycon 9 this year. The paper is neat stuff and I like the information in the margins including map location. That is a definite call-back to the coordinate system on the Darlene maps and nowhere else! Some background on the mesa. A creation of my own, the capital of Ulakand is in the middle of nowhere which seemed boring to me, so I imagined a mesa poking up in the sea of grass, which legend says is the carcass of a deity's horse which died of exhaustion on the plains. In the NW corner of this mesa is Ulakand, nicknamed the "City of Horses". No place in the Flanaess reveres horses more than here. The town proper rests on top of the mesa which can look out on the open prairie for hundreds of leagues in all directions. The part of Ulakand on the ground is mostly tents and corrals belonging to various tribes of Ull nomads. Further into the mesa are other points of interest for wary adventurers passing through including a catacomb to the south and a haunted wood to the NE. The map is keyed you will notice. This is for future reference because I plan to someday put out a gazetteer of Ulakand which will develop all the points on this map in greater detail. I will you keep you posted. Until then, enjoy Ulakand and make of it what you will! 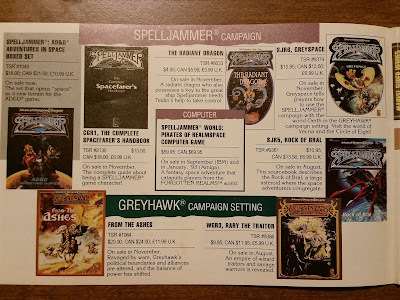 Hello Greyhawk and D&D enthusiasts! 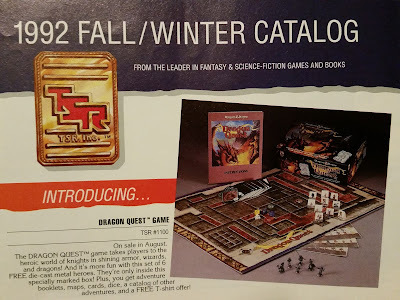 Today I was digging around in my collection and found this gem, the TSR 1992 Fall/Winter Catalog! 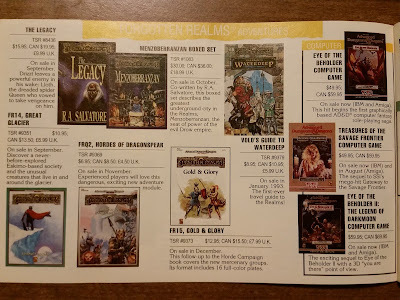 In light of D&D's much hyped products and story events, I'd like to tell you millennial gamers that 1992 was a very good era for the D&D. It was the height of 2nd Edition and there was new stuff coming out every month. 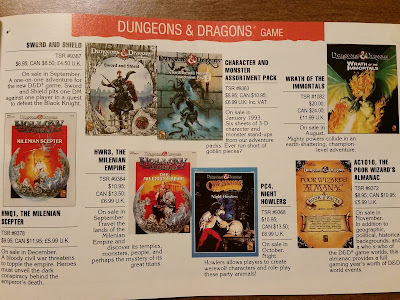 I remember anxiously going to the nearest game shop (for me sometimes half an hour away) to see what would be on the shelves next (especially Greyhawk). Let's have a look and see what TSR had in store for us 25 years ago! Dragon Quest. Never owned it, however I did have Hero Quest which I suppose was a knock off of one or vice versa. No idea. This set gets you a free t-shirt though! Take note WotC. Hollow World and regular D&D products. I did like the Known World and the BECMI sets. After that I didn't collect them anymore. I do wish I had got The Poor Wizard's Almanac though, that looks cool. 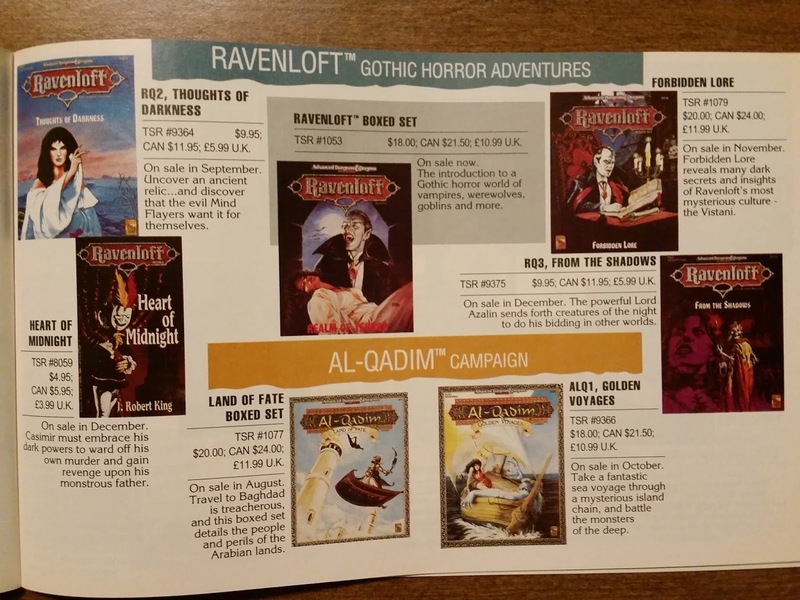 Yes, the 90's was good for Ravenloft setting fans as well. I didn't read the novels, but the source books like Forbidden Lore were my favorite. 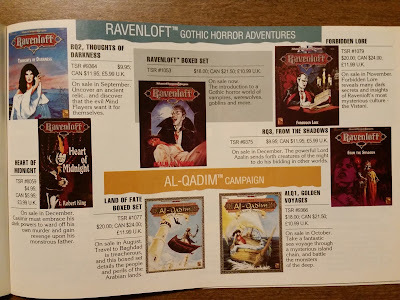 Ravenloft was always fun to break out on a dark rainy day and I like those books so much I keep them on my shelf rather than stored away. I also admired Al-Qadim. This was a time before it got shoe-horned into Faerun. While I never ran the rules, those books were great inspiration for my own Greyhawk adventures set in the Baklunish West. TSR Collector Cards. Good idea, poor execution. They were printed on terrible cardstock, had no custom art (it was all pulled from cropped images out of other D&D books) and in lots of cases had useless information. Sometimes you could find a diamond in the rough, but for canon lore, the cards aren't reliable. Now, the Complete Book of Elves (Elvis) is the best of that 2E series. It's the book that gave us Bladesingers. Enough said! Lankhmar always made an appearance once in a while. Love the novels, not interested in the setting. 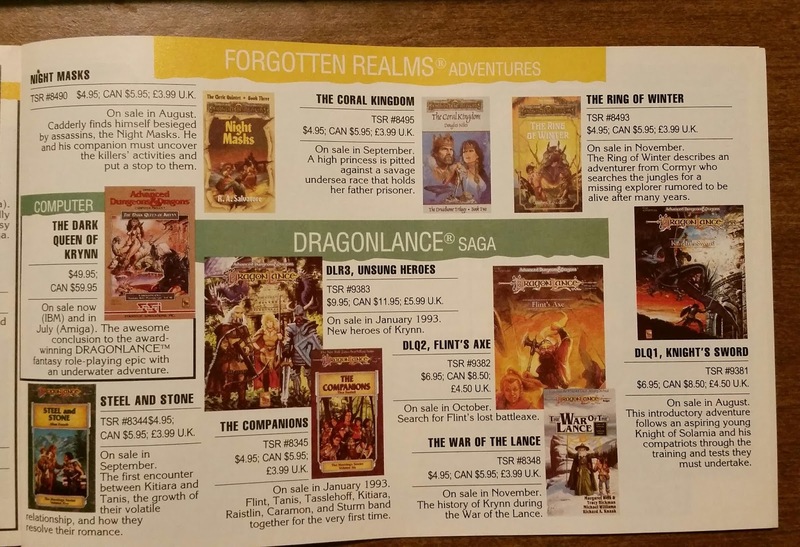 Silly me, Forgotten Realms' novels spill over into the next page belonging to Dragonlance. FR had so many novels that I gave up. I don't know how R.A. Salvatore does it, he writes as much as Stephen King! Meanwhile, Dragonlance still had D&D adventures surprisingly. If any world had MORE novels than FR it was DL. Spelljammer had a good Fall. Source books (Greyspace, woo), a novel AND a computer game. A computer game folks! Below that lineup we then have two sorrowful products for Greyhawk. Just two. No video games for Oerth. What gives? From the Ashes was a nice boxed set, I always liked Carl Sargent's post-war timeline. Rary the Traitor however was garbage. I didn't like the premise of his treachery or the follow up. The book had errors which were later fixed online, it had a terrible cover which was probably intended for something else and just got slapped on Rary last minute, and it had below-average interior art. Rary's only saving grace was that the lore inside on Sulm and the Bright Desert was new to us fans. Later writers would polish this turd to a shine and make Rary's land more interesting. Lastly we have the oddities. 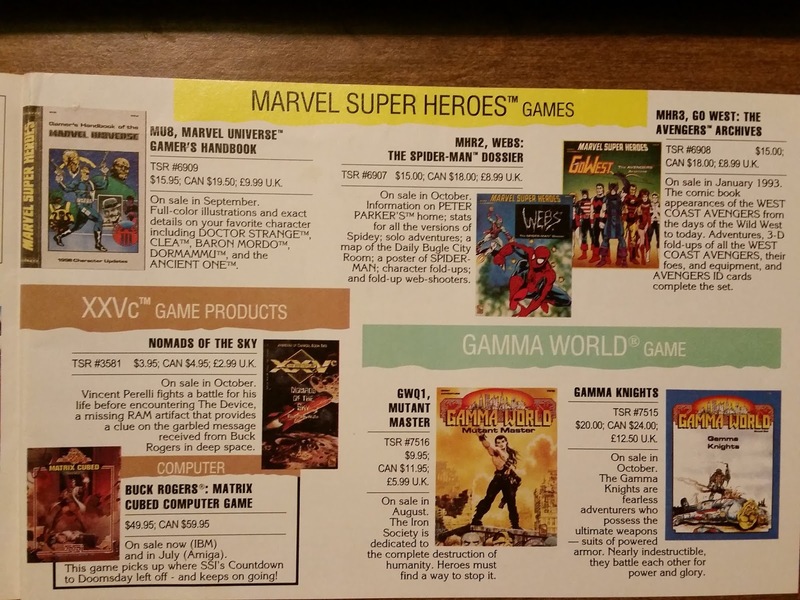 TSR's Marvel Super Heroes was the best. Anyone who knows what FASERIP is had fun times in the 90's gaming. I never owned many MSH books, but I always got excited when new heroes were statted out in Dragon Magazine. Back in the 90's we DREAMED of Marvel movies. Nowadays every C-list hero is getting a movie or show. Back then we had to create our own epic stories. Never got into Buck Rogers as an RPG, but us 80's kids remember the TV show. Then lastly we have Gamma World. This is another game I fondly remember. 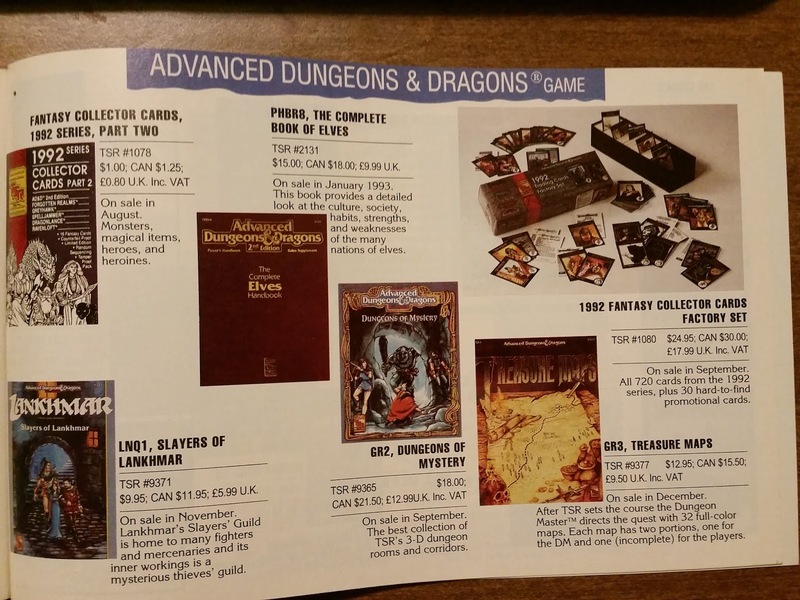 All we ever had was the base boxed set, none of these supplements, but we enjoyed it alot. It was so weird a setting and the post-apocalyptic genre was fresh in our mind with movies like Road Warrior or toons like Thundarr the Barbarian. Plus, given that we lived during the Cold War, GW seemed like a very possible future to us at the time. Sadly I never bought into the later reincarnations of Gamma World. I guess it's better left in 1992 for me. Thanks for reading. Welcome back readers. Well, Wizards' much hyped Stream of Annihilation D&D-fest has begun and the anticipated unveiling of their next story line has been made. All the clues and speculation have turned out true this time, Tomb of Annihilation is the name of this event. It will involve undead and dinosaurs, namely the lich Acererak and the setting of Chult in the Forgotten Realms. Here is my thoughts on the announcement and some other commentary on where Wizards goes from there. 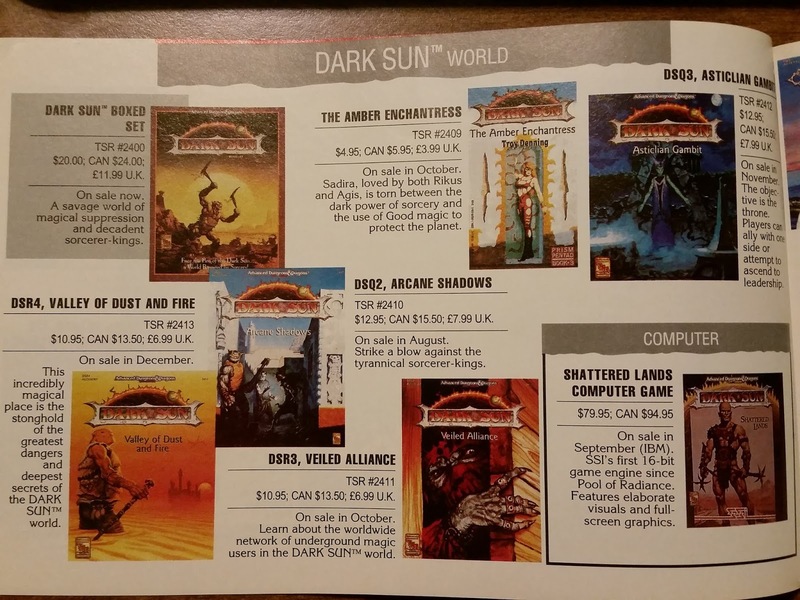 First off, I'm sure a lot of people are disappointed in no Darksun or Dragonlance or hey Greyhawk. Well, Greyhawk fans of all things Tomb can add this to their collection no doubt with little effort. I mean, it wasn't all that long ago Greyhawk stole Isle of Dread into the setting (dinos and demons in that case). As to this storyline it's at least a possible departure from the Sword Coast for a while. I see that Pendleton Ward is involved in this story too. As a big fan of the cartoon Adventure Time, I'm a tad disappointed we won't have a D&D crossover with that world, but I do see what Ward's influence will be with ToA; the main bad guy in Adventure Time is "the Lich". Speaking of liches, I don't know much about the current state or machinations of Acererak, but I'm judging from 5e art, that he is no longer a boring gem-eyed skull on the floor anymore. I also read that there is a variant rule introduced which will make death saves harder. Now that is a good idea! I have not watched the stream yet, but the news flowing in from viewers is positive overall. I'm unsure if this will be something I buy at this time. I'm currently leaning no. Now onto my past predictions. Over the last couple years I've tried to make odds on what themes and stories Wizards will use/rehash for 5E. After using Ravenloft, Giants, and Demons, they are running low on good ones. So now, in one year with Tales from the Yawning Portal and now Tomb of Annihilation, I have two more themes to scratch off. I had predicted (long shot) a jungle module akin to Cult of the Reptile God, Isle of Dread or Dwellers of the Forbidden City, yet I didn't think it would be visited so soon. Good on Wizards for that decision. Second, I had speculated Wizards needed to use a lich for a BBEG story. I assumed Vecna, the original archlich, would be that person (of course). However, I underestimated the popularity of Tomb and its ongoing backstory (Annihilation will be the 5th adventure?). With Acererak ascendant in D&D pop culture, I guess a Vecna Lives! redux is not going to happen any time soon. As usual I've been way off in all my top predictions (except giants, no brainer). Expedition to the Barrier Peaks or Gates of Firestorm Peak continues to be my favorites, and I feel Undermountain or another iconic quest like Rod of Seven Parts is inevitable in the next few years.